After continuously research, we find that the most important thing for a third party inspection company is honest. This is the reason why we used Honor Inspection as the company name. In order to be a honest company, we are very careful in selecting each quality engineer. For each new supplier, our company's branch manager will visit supplier and explain their rights and responsibility. For different products, different suppliers, we will make a detailed professional check list. And then we will arrange the most experienced relative engineers to do inspection. 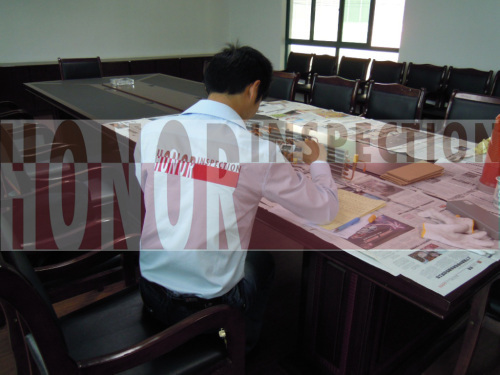 As the inspection is completed, we will send our client the inspection report within 24 hours. For any questions and complaints, we will do a satisfied response Within 24 hours after receive the e-mail. Our price is very competitive; just 250 US dollars for one-man day (not need taxi, bus, hotel charge etc in our branch cities). More than basic services we know clients demand more than basic services from their partners. With many years inspection experience, we have accumulated a lot of better factories. We are glad to help you on it if you are looking for the better factories for better products.